“A big part of Dan’s motivation for moving here was to open that studio, so it was a given that we’d record there,” Patrick Carney tells me a few hours later, sitting outside of the Nashville home he bought several months ago with his fiancée. While he talks, his 100-pound Irish bloodhound puppy, Charlotte, drags an oversized bone across the patio and wags her tail in agreement. She, like her owner, is habitually nice and almost comically tall. Brothers had become the best-selling alternative album of 2010, and The Black Keys found themselves saddled with a new list of expectations from their label, their fans and themselves. They’d gone from Midwest underdogs to Nashville pack leaders in less than twelve months. Recording another album as soon as possible was one method of keeping things under control. This way, they wouldn’t risk falling down the rabbit hole by giving themselves half a year – their typical break between album cycles – to overthink Brothers’ success. There was a problem, though. In their rush to make a new album that didn’t feel like a response to the last one, The Black Keys hadn’t written any songs. With past recording sessions, the guys had done their homework beforehand, coming into the studio with something – a chord progression, a lyric idea, a drum sound – to get the wheels rolling. This time, they started from scratch every single day, splitting the songwriting duties three ways with co-producer Brian Burton, aka Danger Mouse. Songs would be written in hour-long bursts of inspiration, then reworked several times over the course of a few days. Once everyone settled on an arrangement, things would start moving faster, with most of the tunes being recorded in one or two takes. Still, it took a long time to reach that point. Their tour schedule got in the way, too. They’d already pulled the plug on some shows in Australia, New Zealand and Europe, but canceling everything was out of the question. 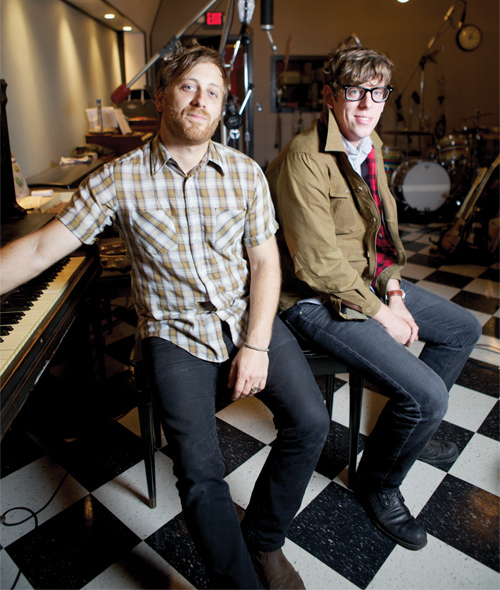 Deciding it was possible to have their cake and eat it, too, The Black Keys began shuffling themselves between the studio and the stage, recording new songs one minute and performing old ones the next. The hard work paid off. El Camino cherry-picks the best things about previous Black Keys records – the mix of ‘60s soul and swampy electric blues; the raw analog production; the psychedelic smog that floats through the background like wisps of pot smoke – and filters them through a smudged-up rock and roll lens. It’s Brothers on steroids, with denser guitars and faster tempos. Carney says the band looked to The Ramones and rockabilly icon Johnny Burnette for inspiration, which may explain why some of these songs are much quicker than anything else in The Black Keys catalog.